Great site with a short film and photos from Royal Arctic Lines supply ships East Greenlandic journeys. Great site with a good overview over what to see and where in Greenland. A prize-winning photographer who ran photo trips in our area in 2010. Books about historical places, people and events in North-East Greenland. Tour description from Marcus who paddled alone in the world's biggest fjord complex. When travelling through Iceland, we recommend the hunting museum in Stokkseyri. Swedish writer & adventurer who spend a wildlife year at Sydkap in the Scoresby Sund fjord system. 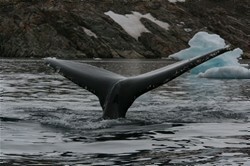 ARC-PIC.COM is an association of Greenland photographers displaying photos on-line. Excellent photos from Ittoqqortoormiit by Carsten Egevang. Writer, Arctic nature and landscape photographer, whom we can highly recommend. 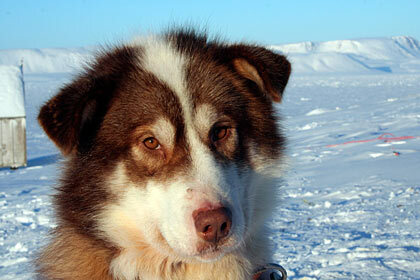 Learn more about Ittoqqortoormiit here . Excellent satellite charts from the east coast. Official website of the school in Ittoqqortoormiit . The site is the place to visit if you need accomodation in Ittoqqortoormiit . Check out the weather in Ittoqqortoormiit . Norwegian website with Greenland forecasts. Very informative website about east Greenland . 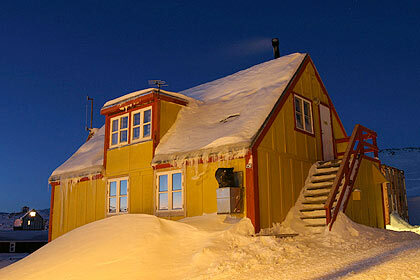 Very informative website about tourism in Greenland. See the Ittoqqortoormiit area from above. Insert 22 degrees West and 70.30 degrees North. Information on how to ship cargo in and out of Ittoqqortoormiit. Also ail plans for our two yearly supply ships. The Greenlandic paper with updated news from Greenland. Use Google Translate to see in English. Official website of the Greenlandic government. Greenland house in Aalborg, Jutland . Aalborg is one of Ittoqqortoormiits 3 friendship cities . The primary airline providing flights to Constable Point/Nerlerit Inaat and helicopter connections to Ittoqqortoormiit.